Tidal energy offers huge power potential for the U.S., and that potential is now becoming a reality with the commissioning of the first phase of the Maine Tidal Energy project. Ocean Renewable Power Co. LLC's patented TidGen turbine generator units (TGUs) employ cross-flow turbines with foils that resemble those of a steamboat paddle wheel. The turbine axis is perpendicular to the direction of the current flow. Currents turn the foils, which power a central permanent-magnet generator. Ideas on harnessing the ebb and flow of ocean tides to generate power are nothing new to Maine, with several commercial-scale projects having been proposed over the past decades. But it wasn't until the first phase of Ocean Renewable Power Co. LLC's (ORPC) Maine Tidal Energy Project was commissioned this past September that a grid-connected commercial-scale application of hydro-kinetic technology without a dam came to fruition in North America. under about 100 feet of water in Cobscook Bay, said John Ferland, ORPC vice president of project development. Although the difference between low and high tide only differs by about 18 feet where the turbine is located, it can vary by more than 50 feet in other parts of the bay. D.C.-based Ocean Renewable Energy Coalition, citing reports from 2011 by Georgia Tech and the Electric Power Research Institute. In that study, researchers used computer modeling to identify locations along the U.S. coast with the potential for wave or tidal energy generation. Combined, the sites have the potential to produce about 50 gigawatts, according to the report. Alaska comprised the largest chunk with 47 GW, and Maine came in third with a 675-MW potential. At the same time, O'Neill said the wave and tidal-generation industry worldwide could create 160,000 new jobs by 2030, according to figures from Ocean Energy Systems, a technology initiative of the International Energy Agency in Paris, France. "We need to get these new technologies, but we need the generating capacity in place in order to turn off some of these older (fossil fuel) power plants that are 50, 60, or 70 years old," he said. "We're talking about engaging with our oceans in a responsible, careful way, and I think in so doing, we're part of the solution. "ORPC has done a wonderful job in Eastport and Lubec, and they've set an example that will help this industry move forward very quickly." The first phase of the Maine Tidal Energy Project in Cobscook Bay involves three patented TidGen turbine generator units (TGUs). The first unit is installed and has been generating power since September 2012. ORPC will monitor it for a year before installing two more units, giving the company time to evaluate performance, Ferland said. "Part of the process is continuous improvement," Ferland said. "We're using this first year to achieve maximum turbine design and efficiency. Other work will look at how we install, how we retrieve, and how we maintain it. The other part will be what we've learned about the marine environment and how we work with the regulators to ensure we can move forward to the next step." The TidGen uses cross-flow turbines with foils that resemble those of a steamboat paddle wheel. The turbine axis is perpendicular to the direction of the current flow. Currents turn the foils, which power a central permanent-magnet generator. 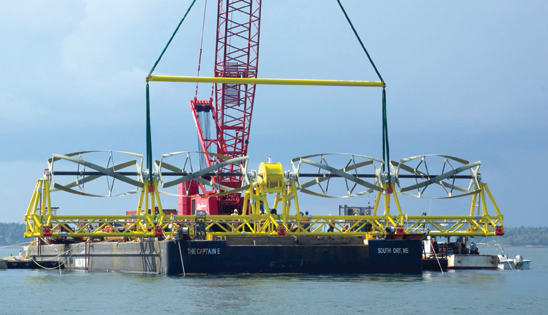 The TidGen unit is mounted on a frame anchored to the ocean floor and is designed for shallow to moderate tidal areas with water depths of up to about 100 feet deep. Each unit is rated to produce 150 kilowatts with maximum output of 180 kw, Ferland said. The patented OCGen system is designed for water depths greater than 80 feet, such as those found in Maine's Western Passage. Instead of being mounted on the ocean floor, the TGUs are moored to the ocean floor. TGUs can be stacked two to four high, creating a more powerful generating system. Ferland said ORPC plans its first OCGen installation with two units, and subsequent ones will feature four units. He credited a cooperative research and development agreement (CREDA) with the U.S. Navy for the turbine design that has allowed the Portland, Maine-based firm to commercialize grid-connected tidal generation. "The Navy CREDA was critical in this," Ferland said. "The bottom line was you can't look at windmill-type designs underwater that are going to work well. "We needed a design that was built for long-term sustainability and durable enough to withstand the forces that impose stress on all of the product and not just at key points. "We feel that we have this design that's not only durable, but because of its modular characteristics allows us to scale up and scale down." The Cobscook Bay phase has been a long time in coming, with ORPC first applying for a Federal Energy Regulatory Commission (FERC) preliminary permit in 2006. Perry Marine & Construction of Portland, Maine, was the general contractor for the Cobscook Bay project, including overseeing assembly of the 31-foot tall, 93,000-pound bottom support frame or foundation for the TidGen device. Altogether, the project sourced material, expertise, or labor from more than 90 different companies, of which about 80 percent are local to Maine. The commission reviews permits on a first-come, first-served basis, and the preliminary permit holds a spot in the queue while entities collect the necessary site characteristics and perform required analyses, Ferland said. "We did need to work with the regulators and provide the education that would help them make good decisions. And part of what enabled us to do it was the regulatory reform that helped create the pathway through the process," Ferland said. At the same time, the state of Maine signed a memorandum of understanding with FERC that aligned its regulations to support tidal generation development. "Being able to go through the regulatory process with federal and state agencies asking for the same information—that alignment was very, very important," he said. Based on the experience, he said he hoped it would now be a three-year cycle from project concept to licensing. The regulatory process also helped ORPC secure 20-year power purchase agreements for a higher-than-market price, Ferland said. In April 2012, the Maine Public Utilities Commission approved contract terms for 20-year power purchase agreements for the project, marking the first long-term tidal energy PPAs in the United States. The commission's order also directed the state's three investor-owned utilities—Central Maine Power Co., Bangor Hydro Electric, and Maine Public Service Co.—to negotiate PPAs with ORPC.The Cobscook Bay phase will feed into Bangor Hydro Electric's grid. In addition to the FERC license, the project also needed a National Marine Fisheries Service permit, a Maine Waterway Development and Conservation Act general permit, and Maine Department of Conservation submerged lands lease. As part of its initial exploratory phase, ORPC conducted a year-long test on a prototype model of its turbine generator unit beginning in December 2007. It was about one-third the size of today's TidGen and exceeded expectations in 10 of 12 criteria. From the outset, ORPC met with state and local officials and other stakeholders to conduct educational sessions and enlist their support and expertise. As a result, Ferland said the project had little opposition. For example, ORPC worked with the local fishing industry to identify sites that wouldn't interfere with the productive scallop dragging business. "From a Maine standpoint, what we have here is a world-renowned marine resource and a state policy in place that are available for energy development," Ferland said. "And we have two host communities who have embraced this technology. "These are historically waterfront towns with centuries of economies built around how they use the ocean—people who work with high skills on the water, under the water, or next to the water serving others who work around the water. "What we're hoping to do is take these skills that exist throughout time here and apply them to our project." Perry Marine & Construction (PMC) of Portland, Maine, is the general contractor for the current Cobscook Bay project, including overseeing assembly of the 31-foot tall, 93,000-pound bottom support frame or foundation for the TidGen device. In addition to the bottom support frame, Newport Industrial Fabrication Inc., of Newport, Maine, fabricated the TGU's chassis with input from Alexander's Welding & Machine Inc., of Greenfield, Maine. NIF also fabricated the 10 steel piles that secure the device's bottom support frame to the sea floor. Altogether, the project sourced material, expertise, or labor from more than 90 different companies, of which about 80 percent are local to Maine. Once the bottom support frame was built, PMC conducted a dress rehearsal to practice lowering it precisely into position at the Cobscook Bay project site during 40 minutes of low slack tide. On March 20, 2012, a barge equipped with a crane lowered the frame to the deployment site. Hardhat divers helped guide the frame into its proper position. Over the next couple of weeks, the 10 steel piles were driven into the sea floor to secure the bottom support frame. Each underwater operation had to take place during low slack tide. PMC then used a shear plow to install the underwater power and data cables, connecting the unit to a Bangor Hydro substation in Lubec. At one point, they had to make a tricky 90-degree turn along the route. Monitored and guided by underwater divers, most of the cable was buried under the ocean floor except along a rocky portion that prevented burying of it. In addition, ORPC had to upgrade about three miles of Bangor Hydro's service lines on land. PMC also oversaw assembly of the roughly 100-foot long turbine generating unit, or TGU. As with frame installation, PMC conducted a dry run to perfect TGU mounting since it had the same 40-minute window of low slack tide. On August 14, 2012, the TGU was attached to the support frame in about 60 feet of water. Local observers who were trained by experts from the New England Aquarium monitored the operation to watch for, and track, marine animals that might be encountered. The unit went online in mid-September and generates electricity for about 20 hours per day, discounting for the slack time between tides, Ferland said. And there's more to come. In addition to Cobscook Bay, the Maine Tidal Energy Project will include about two dozen OCGen TGUs deployed in the deeper water of Western Passage. At complete build-out, anticipated in 2016, the overall project ouput is expected to be 5 megawatts, which represents a solid start to harnessing tidal energy in Maine and the U.S.